Purslane is that succulent weed you see crawling its way across soil and out of sidewalk cracks everywhere. Did you know its edible and medicinal? Due to its succulent nature, purslane is mucilagenous making it deeply hydrating to the body and soothing to the mucous membranes. It is also cooling and help clear heat. This mucilagenous and cooling quality makes purslane ideal for healing inflammation or irritation in the GI tract, lungs, urinary tract and skin. Purslane makes a great addition to your salad, as it is nutritive rich and full of vitamins, minerals and omega-3 fatty acids. 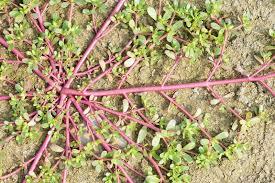 Eating purslane helps balance and improve blood sugar metabolism. The simplest way to enjoy purslane is to chop it up and throw it in your salad. It an also be juiced, lightly steamed or pickled. Purslane can also be made into a tea or fresh tincture. Purslane also makes a delicious relish. Cautions/Contraindications: Contraindicated with pregnancy and cold stomach conditions.